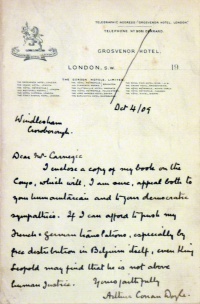 This letter was written by Arthur Conan Doyle on 4 october 1909 from Windlesham, Crowborough addressed to Mr. Carnegie. Conan Doyle sent with the letter his book The Crime of the Congo published by Hutchinson & Co. in october 1909. I enclose a copy of my book on the Congo, wich will I am sure, appeal both to your humanitarian and to your democratic sympathies. If I can afford to push my French and German translations, especially by free distribution in Belgium itself, even King Leopold may find that he is not above human justice. This page was last edited on 26 January 2017, at 14:41.